safety alert * use a low watt bulb and ensure material chosen is not touching or close to the bulb. 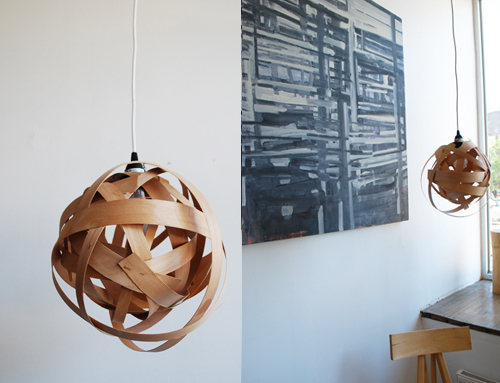 take the strip of wood veneer and make a circle shape to the desired size you want your lamp to be. place a small amount of glue to the attachment and hold with clip. proceed the same way as in step one - creating an overlap on the other strip of veneer. take smaller strips and weave through the lamp continuing in a circular manner. secure any overlaps with glue and clip - also allow the glue to dry - it will make it easier to work with the shape. find a spot on your form for the light and pull through the cord. it's important to place the light in the centre so that the shape hangs leveled. make sure there is a spot big enough for your hand to screw in the light bulb. before you are done - look at the lamp and decide if you need more strips or if there are areas you need to secure with glue. once your done - use the instructions in the HEMMA Ikea package on how to hang from your ceiling. Enjoy! Amazing! I've been wanting to create a few different DIY pendant lights for my craft room. This is being added to the list! So fantastic! This even looks easy! this is great! thanks for sharing!!! Bookhou, I used to live 2 doors down from you until this month! Amazing work, and this is a great DIY! thanks! the material is really light and also if your good with your glueing - there is no limit to scale. so glad you all like the project. I think this is something that I can do and it looks lovely! Looks manageable! This is such a cute idea. Thank you Arounna for this - I love it! Thinking of trying soon! so cool!! i just went to this place for the first time to check out doors and it was awe-inspiring for any wood lovers -- windsor plywood has tons of cool strips and bits of interesting wood. definitely worth checking out and getting inspired by all the random pieces of exotic lumber! Oh my gosh, the wood veneer lamp is going on my dream project list. Thanks! these are so great, arounna! this is a great idea, i love how easy this is. what size of wood veneer did you use? and are they fragile? Great Lamp. What is the maximum wattage? Also, is a hot glue gun better than white glue? I'm loving the art on the wall in your photo. Can you tell me who the artist is? Thanks! We found your project really inspiring for our living room and yesterday we finished three on our own, reaching from 30 to 65cm in diameter.